Waterproof 5-inch Full HD HTC J Butterfly Lands in Japan; Another Challenger to the Samsung Galaxy Note 2? When does a phone exactly become a phablet? When it starts having tablet-like features and functionality, like a Samsung Galaxy Note 2? Or is it already considered a phablet the moment its screen size hits 5-inches? Whatever the case, fans of smartphones with big screens have another reason to rejoice — Taiwanese manufacturer HTC has just launched the HTC J Butterfly, a new 5-inch device that seems geared towards people with a more active lifestyle. We’ve had our eyes on another 5-inch device from the manufacturer, the HTC DLX, and its a surprise that they managed to sneak this one past us. The HTC J Butterfly comes with a Super LCD 3 display and is the first smartphone to come with a 1080p Full HD screen, definitely better than what the Samsung Galaxy Note 2 is packing. How cool is that? The device was shown off by Japanese carrier KDDI and boasts of a 5-inch screen with a 1920 x 1080 resolution, a 1.5Ghz Snapdragon S4 Pro quad-core processor and 2GB RAM, Bluetooth, WiFi, LTE and NFC capabilities. On the camera side of things, it comes with an 8 MP snapper in the back and one with 2.1 MP in the front. Storage is at 16 GB but is expandable via microSD. 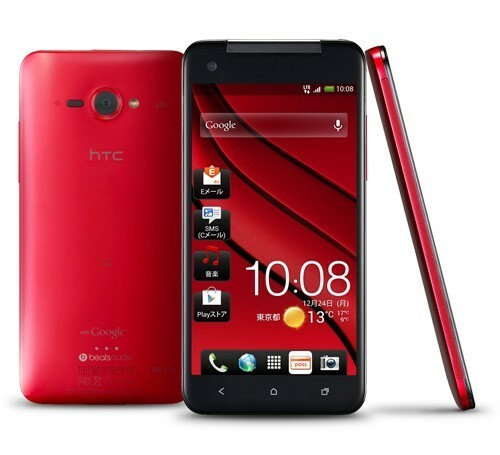 The HTC Butterfly J will be running Android 4.1 Jelly Bean out of the box. If those features aren’t enough for you, then you may want to know that the HTC Butterfly J can work on both CDMA and GSM networks, making it a global phone. What’s more, the device is also waterproof. Can other phablets currently out in the market like the Samsung Galaxy Note 2 and the LG Optimus Vu claim the same? The device’s screen also has 440ppi, easily beating out the 326ppi of the iPhone 5’s Retina display. The device drops in Japan this December and will be available in red, white and black. No word yet on whether it will be available in Europe or in the US but we’ll be sure to keep our ears on the ground for more info. Would you pick the HTC J Butterfly over other big-screened devices like the Samsung Galaxy Note 2 and the LG Optimus Vu? Does it sound like a better option than the iPhone 5? Discuss in the comments below!